To purchase Gift Cards, click on the “Buy Now” button below. You will be taken to the PayPal website where you can enter any denomination (between $20 and $1,000) and the quantity of gift cards you want. A physical Gift Card or Cards will be mailed, usually within two business days, via standard USPS to the shipping address you provide us through PayPal. IF you are sending the Gift Cart to another person remember to put their name and address in the Shipping address. Contact James F. or Jennifer S. via email or by calling Rainbow’s toll free number (877) 720-2667 (extensions #337 and #345 respectively) to ask questions. Click on the Paypal link below. You do not need a PayPal account. Simply, enter the amount and number of Gift Cards and then process your order through using the payment method of your choice. The balance of an existing card can be checked at any register or by checking online at https://balance.worldpay.us/GLCardBalance.aspx. As of August 23, 2017 the 888 phone number on the back of some Rainbow Gift cards is no longer valid. Gift cards are also reloadable. This can be done Online by placing a new order here and then sending an email containing your name and the Gift card number on the back of the card. 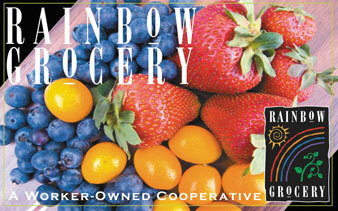 Rainbow Grocery is not responsible for lost, stolen or destroyed Gift Cards. Treat a Gift card as cash.